It took me a while to embrace the greens, I admit. Oh, not the salad mix, or spinach, those are pretty easy to love. And Swiss chard is home and mother to me as I grew up eating it from our backyard garden. My trouble with spring greens is this: while I like cooked greens, by May/June I'm craving light, fresh fare, not long-simmered flavorful "pots of greens" goodness. Yes, I could put the greens up to enjoy in winter soups. 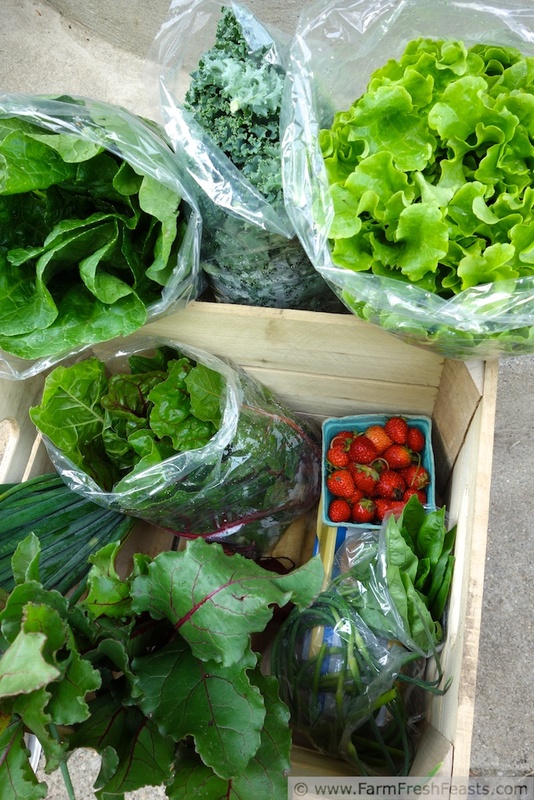 But it's not even summer yet, and I'll be getting more greens at the end of the CSA season as the weather turns to fall. I needed to find ways to enjoy my spring greens NOW. Not interested in kale on a pizza? 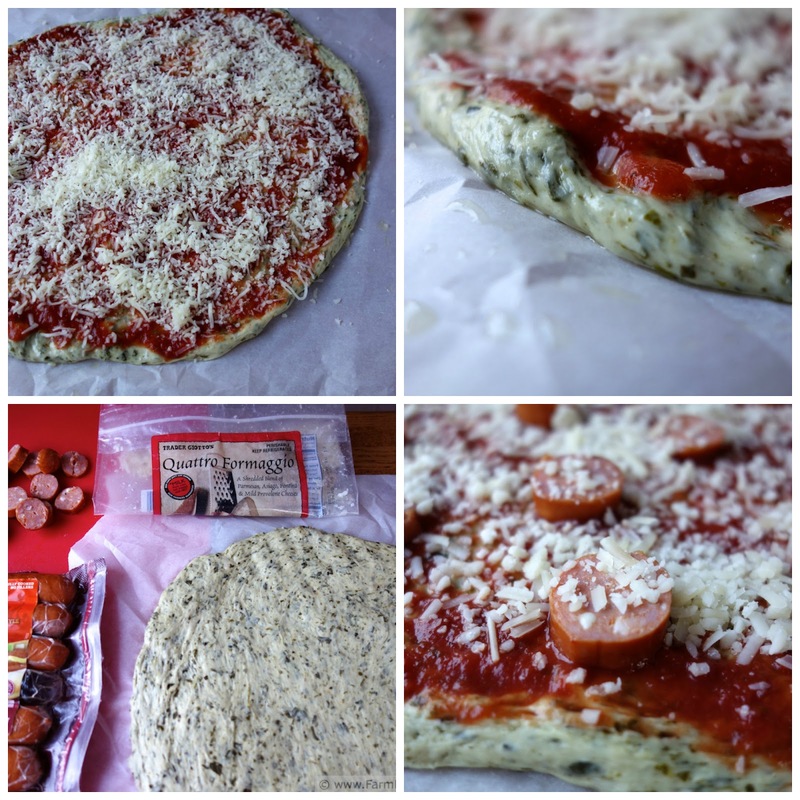 Try my Visual Pizza Recipe Index for other ideas! In a quixotic move, I use both an old school steamer and a bread machine to make this dough. I use the steamer because I wanted to be sure that my weights for this recipe were unaffected by how well I drained the cooked kale. (I also got the steamer from my mom a few months ago, used it for gyoza/mandoo and realized it's a pretty useful thing to have around.) If you don't have a steamer, use a microwave or a lidded pot with a small amount of water to cook your kale. I like to use a bread machine to mix my pizza doughs that contain green leafy vegetables because I can focus better on the dough. My teenaged son tells me that humans aren't physically capable of multi-tasking . . . I'll just say that deciding how much to knead the dough while simultaneously deciding how much water to add to the dough is a difficult task for me. I find it easier just to let the dough cycle worry about the kneading part and I'll worry about the extra water part. Why don't I know exactly how much water to add? This kale is not from factory farms with standardized growing conditions. It's been a cool, wet spring here in Ohio, and the water content of the blue curly kale from my CSA is probably different than the water content of your Red Russian or Lacinato kale grown in a drier climate. All will work in this dough, though. To help, I've provided both the weight and volume measurements for my raw and steamed kale, as well as photos of the whole process. Clockwise from upper left--the basic kale pizza dough process. Place several inches of water into the base of a steamer pot. Bring to a boil over medium-high heat. Add kale to steamer basket, and steam 12-15 minutes until leaves are just tender. Remove from heat. My 4 packed cups of raw kale decreased to 1 generous tightly-packed cup (2 cups very loosely packed), weighing 3 1/4 ounces or about 90 grams at this point (yes, it got smaller and heavier--like a Black Hole of Kale?). In a bread machine bucket, place kale, flour, yeast, salt, seasonings and oil. Add 8-10 Tablespoons of the steaming water (what with all the weighing and measuring and photos the water had a chance to cool down from boiling to merely warm when I added it). Start the dough cycle, and let the machine knead for about 3 minutes before checking. If/when the dough looks dry still, add a Tablespoon of leftover steaming water at a time, giving a minute or so between additions, until the dough forms a ball in the pan. Then walk away and let it finish kneading without hovering. You're not going to do any additional good. Store in an oiled container in the refrigerator for a few days, or pop in the freezer (label it for my sake please). I made a 2 pizzas with this batch of dough: a simple cheese pizza and a spicy buffalo sausage pizza. On the day you wish to bake a pizza, about 2 hours before you're ready to bake, have your child remove the chilled dough to the counter so it can come to room temperature and the yeast can wake up and do its thang. About 30 minutes to an hour before you're ready to bake, preheat your oven to 450 degrees Fahrenheit. If you've got a pizza stone, now is the time to put it in the oven to preheat. Or just leave it in there. If you don't have a stone, get one at a thrift store while you're getting a bread machine use a cookie sheet or other rimless pan. Divide dough into two equal portions. On an oiled piece of parchment paper, stretch out each dough into the shape that pleases you. Spread 1/2 cup sauce over each dough, coming close to the edge--but don't go over! Scatter half the cheese on each dough. Top one pizza with buffalo-style sausage slices for the more adventurous eater of the household. 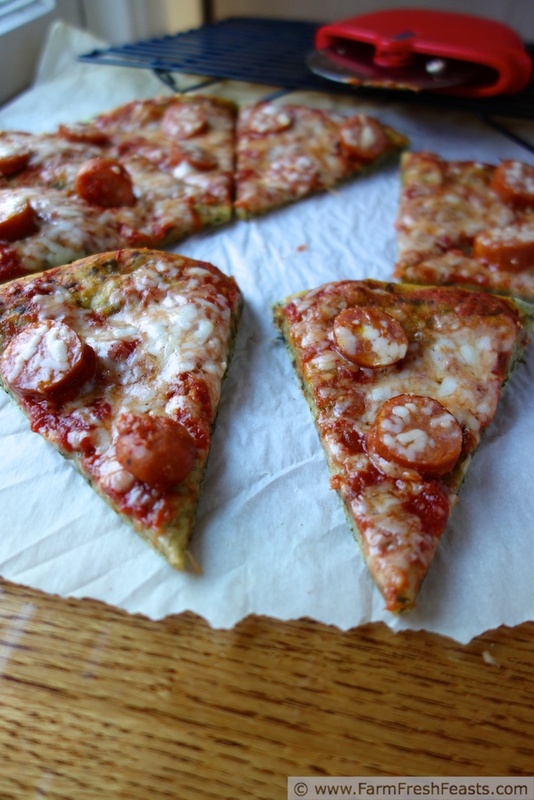 Slide the pizza-on-parchment onto your baking stone or cookie sheet. Bake 5-8 minutes, then shimmy the parchment out from under the crust, allowing the crust to bake directly on the stone or sheet. After another 3-5 minutes, when the cheese is browned and bubbly, remove the pizza to a cooling rack and slide the second pizza in. Repeat the baking/shimmying/baking/cooling process. Slice and serve. Enjoy mastering the bag of kale this week. And if you're curious what else I've done with pizza and kale, I'll show ya. 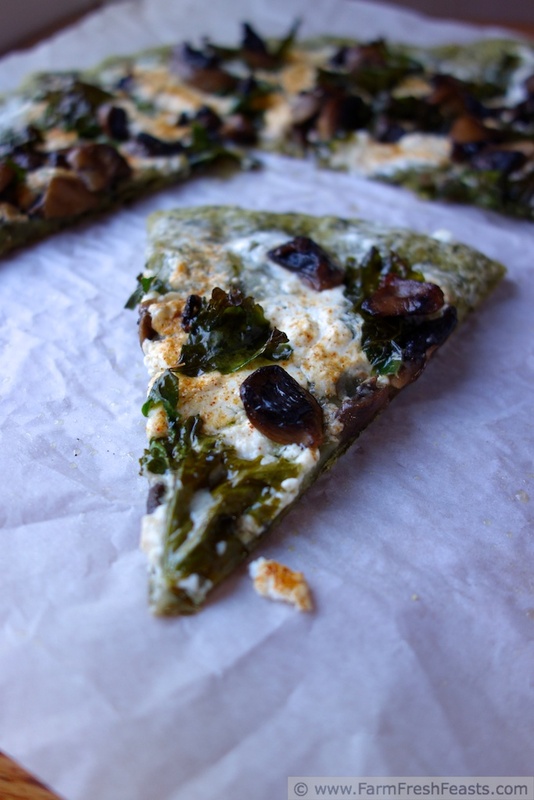 Find the recipe for Spicy Kale Pizza with mushrooms and cottage cheese here. How 'bout I tell ya what I topped it with (it's a Spicy Kale Dough) and you go from there? I got the idea from Tammy at Agrigirl, who said she likes cottage cheese and spicy greens on a pizza. I like cottage cheese and seasoned salt scooped up with ruffled potato chips ;) . I spread cottage cheese on the spicy kale crust, topped it with sautéed mushrooms and torn kale that I massaged a bit with olive oil from the oiled piece of parchment, and shook some seasoned salt over the whole thing before baking. Yum! Had that (intended, this time) Kale Chip Side Effect and was creamy and delicious. Now can you wait for the real recipe? Thanks! I work at a thrift shop, and we get bread machines in all the time--if you have space and some spare cash, try your local thrift shop for one. It really makes veggie dough easier. I love this!!!! What a great use for Kale! I figured it was a natural progression from spinach to kale, and I wasn't wrong in my figuring. I'm glad--all that weighing and measuring for a bomb recipe would be a waste! Kirsten, I can relate to being overwhelmed by so many greens from the farm in June. 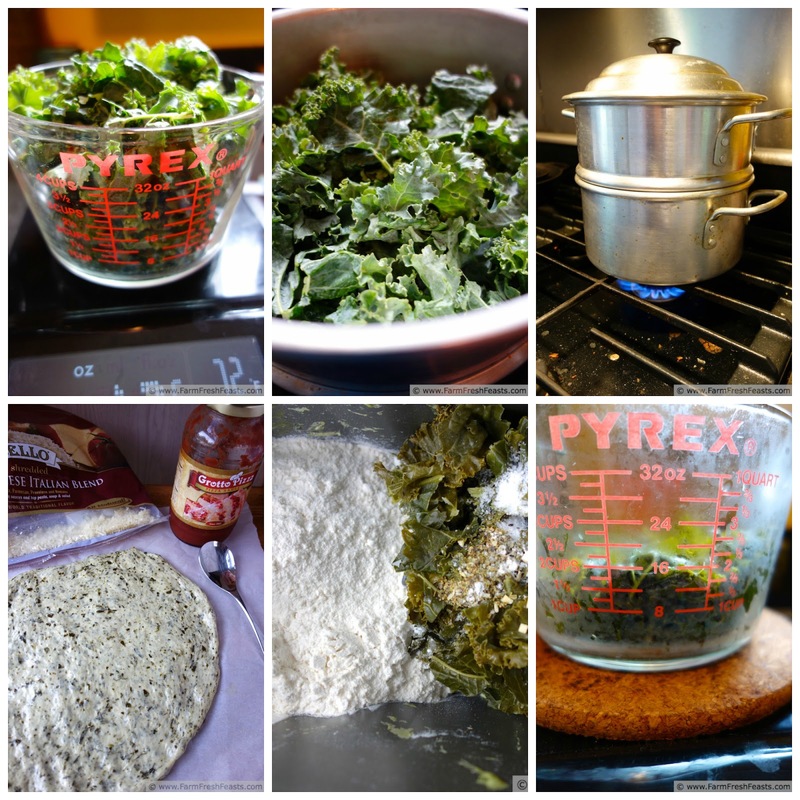 I never tire of kale chips, but I think my family is getting a bit bored with them so I should try this crust. Thanks!! I love kale chips, but I'm the only eater at home who will eat them now, and I do prefer them fresh, not days old, so I need alternate ideas. Like this one. If you try it, please let me know how it goes--you take such lovely photos. It IS all about the greens, but other than one bunch of kale, I'm swimming in lettuce. Green leaf, romaine, loose leaf, lettuce, lettuce, lettuce. I didn't buy my typical premade lunches this weekend. Instead, I think it's going to be a hefty lunch time salad kind of week. I also made a huge salad (and a casserole of macaroni and cheese) for my girlfriend who just had the baby. Even after that, I'm two weeks into my CSA and I've got four heads of lettuce in the fridge. I better get foraging. On the FB page I shared a link to Agrigirl's post all about what to do with extra lettuce. She's got great ideas. I've been able to keep up with lettuce so far, primarily because the composting pigs will eat the bruised lettuce at the bottom of the bag, but I will turn to Tammy's ideas when it gets overwhelming. Great idea!! We have homemade pizza all the time, this is a great way to sneak in some extra veggies. I think it's kind of blatant for sneaking, but yes, I know what you mean. Let's say "boost the veggie content" maybe? Whaaaaat?!? Your spin on everything-pizza always amazes me! Love your creativity!!! I'm glad to learn of your blog--I'm always looking for more ideas for greens. We frequently have pizza & a movie, so perhaps sometimes they are distracted by the movie and don't notice at first what they are eating? Or perhaps I've worn them down over time (and crazy pizza doughs). I love love love this idea!! I'm a HUGE fan of kale and am always looking for new ways to get it mah belly! Following you! I love the name of your blog: From Everyday to Gourmet, it sounds so nice out loud too! 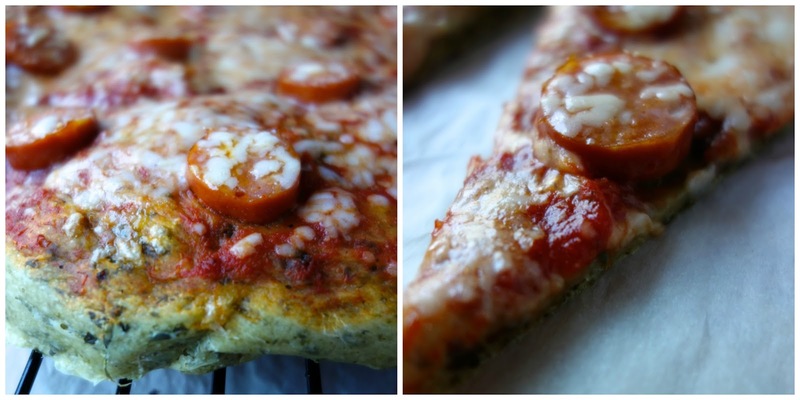 I will definitely be making this pizza soon. I have become a big fan of kale and this is a great way to use it. Great idea and great pictures.Thank you for sharing with the Clever Chicks Blog Hop this week; I hope you’ll join us again! Any suggestions on getting my kids to become big fans of kale? Wow! I LOVE kale and am looking for new ways to cook with it! This is going on the menu for July!Thank you so much for linking up with me this week at Tasty Tuesdays! I’ve pinned this & shared it with my followers! Thank you for pinning, and for hosting! I confess that spinach is my favorite for green smoothies, but I use what I've got, so it can be kale, chard, or whatever for the green in the smoothie. And my favorite pizza, My Deployment Pizza, is on a spinach crust. Thanks for pinning, and thanks for co-hosting! This is so clever and original! And guess what? I have kale in my garden. It's been left to appease the groundhog, but not anymore now. I'll wrestle my kale leaves out of his teeth if I have to, I'm making that pizza dough! Great blog! I thought I'd be clever and plant re-grown celery in my garden, early, to ward off varmints taking the crops I really wanted. Unfortunately they don't seem to care for the celery, preferring instead the tender parsley, fennel, and dill plants. 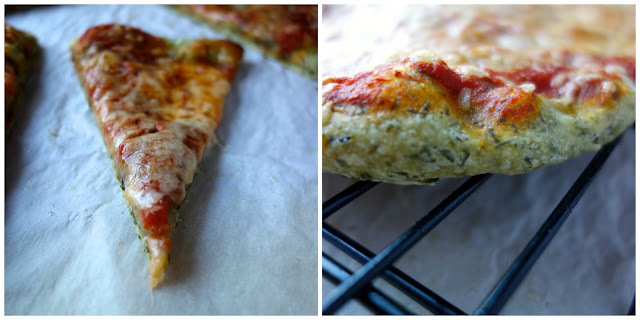 My new favorite crust...Kale all the way!